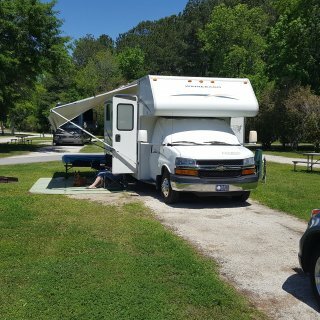 We have camped here many times over the past several years while visiting family in the area and also shopping, touring in the Charlotte NC area. Very nice county park and campground on Lake Wylie. No cable but there is good reception with conventional antenna. Most sites have a little slope so leveling is necessary. The location of the sewer hook up in a lot of sites is near the front of the site. You may need up to four sections of sewer hose to connect depending on the location of tank connections. We camped at Ebenezer Park in a Motorhome. This was our first time at this KOA. This is a beautiful well maintained KOA. We arrived coming north on US17 and had no trouble finding the road leading to the park. Going south when departing there was a service road to take which came out at a road with a traffic light so we could make a left turn safely onto US17 south. We camped in a 32 foot motorhome. We camped at Mount Pleasant / Charleston KOA in a Motorhome. We have camped here many times in the past. We were in site 414 along the river. We like the river sites because there is plenty of room behind the river sites to walk our pet. We like the improvements the park has made to the pool area with the new lazy river addition. We camped at River Plantation RV Park in a Motorhome. we visited the titanic museum this visit and enjoyed the tour expierence. Very nice park with shaded sites. lots of activities for kids. We camped at Gettysburg / Battlefield KOA in a Motorhome. Purpose of our stay was to tour the Gettysburg National Military Park and Museum & visitor center. We also took the guided bus tour of the battlefield. In addition we visited the Eisenhower Home and farm. We made an overnight stay here on our way north. The campground is easy to access off of I-81. In the front section of the campground has an area that has water and electric hookups with pull thru sites which is great for an overnight stay. We camped at Walnut Hills Campground (formerly Staunton / Walnut Hills KOA) in a Motorhome. The campground has two sections. We stayed in the Live Oak Campground. We were in site 90 which was deep enough for both my 32 ft RV and the towed car to be off the road. All access roads are dirt/gravel and were in fairly good shape. Lots of shade at our site and a sense of privacy due to the foliage surrounding the site. The shower/restroom building appeared to be brand new and it was well keep up. Our rate was just under $22 a night due to the senior citizen discount we got. The RV dump site was across the main highway from the campground and on the way off the island. Access to it was easy. One thing I did not like was the fact that there was a back exit to the campground onto the main highway. Would have felt more secure is there was a locked gate on this access. We camped at Edisto Beach State Park in a Motorhome. Very nice campground with a private beach. All sites are with concrete pads and patios. We were on site 36 which is the only site that does not have on site parking for a towed car. However there was a reserved parking spot for our site a short distance away. Restrooms and showers were very clean. Showers were large. There was a separate area to walk dogs. Next time we use the campground we will try and get one of the beach sites. We camped at Emerald Beach RV Park in a Motorhome. This is the fourth time we stayed at Stone Mountain. As noted in other posts, if traveling in a motorhome, the loops by the office (Trail F and trail E) is best for getting around. The sites on Trail F also have propane grills and wooden decks. A nice surprise on this stay was that the park had cable installed in the loop we were on although I had to go up to the office and request a list of channels that were available. The staff was very friendly and helpful. 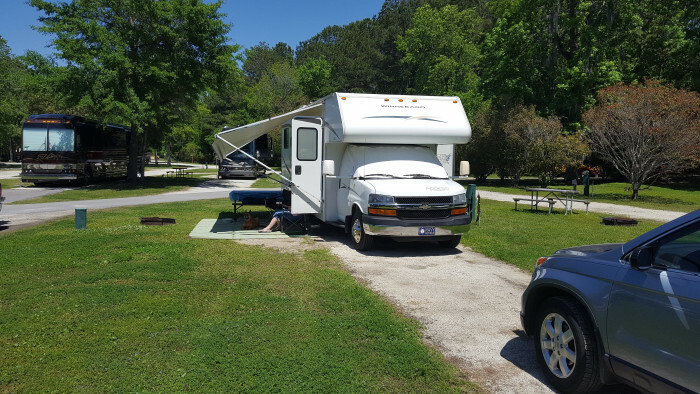 We camped at Stone Mountain Park in a Motorhome. This is by far the best KOA we have stayed at so far. The grounds were well maintained. All the pull thru sites were paved with concrete patios. The leash free dog camp was really great. Very nice pool area and hot tub. Nice fenced in play area for children. Convenient to all the Disney Parks. We will camp here again. We camped at Orlando / Kissimmee KOA in a Motorhome. We stopped over for the night on our way to Florida. Easy access to I-95. Staff was very friendly and helpful. They made sure I had a pull through site so I would not have to unhook my towed car. Good safe and secure KOA for an overnight stay. We would stay here again if traveling through the area. We camped at Savannah South KOA in a Motorhome. Very friendly and helpful staff. No cable, and TV reception was poor. Easy access, very quiet and well maintained KOA. The main reason we came to the area was to visit the Baseball Hall of Fame in Cooperstown. Had a great time. Also check out the New York State Farmers Museum. Veterans got in free. We camped at Cooperstown KOA in a Motorhome. This was a nice campground in the heart of Amish country. We originally booked for just two nights, but ended up staying an extra three nights. Staff was very friendly. Rest rooms were clean. We will stay here again. We camped at Flory's Cottages & Camping in a Motorhome.